One of the brightest new spots for me in the comic book industry is the dynamic duo of Amy Reeder and Brandon Montclare. I first came across them at their booth at Special Edition NYC a year or so ago. That day I picked up their Halloween Eve (Image Comics) drawn to it by their charm and Amy's amazing artwork. 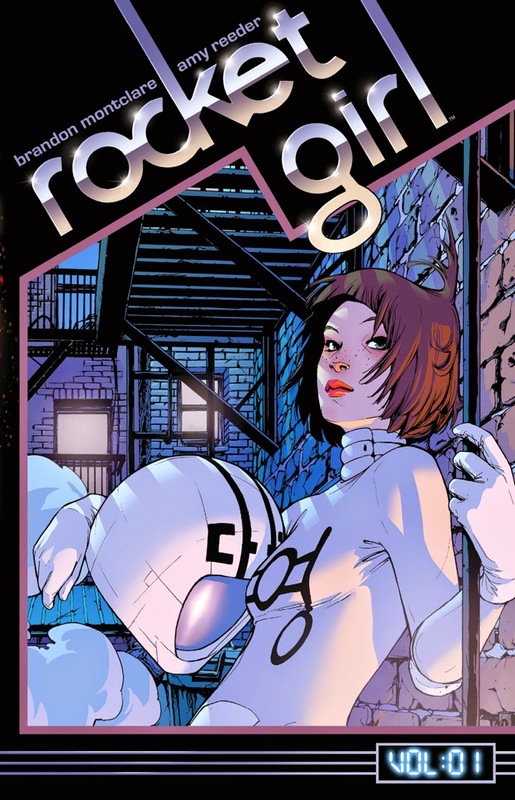 Rocket Girl has been their next project, an ongoing series published also by Image Comics that tells of a displaced teenage time traveled cop in the 1980s. I was able to read up on the first trade paperback aptly titled Times Squared while on jury duty no less. As with Halloween Eve, I am deeply impressed by Amy's art style which combines a blend of simplicity and fluidity with amazingly detail backgrounds when needed or just empty space as the panels above and below shows. 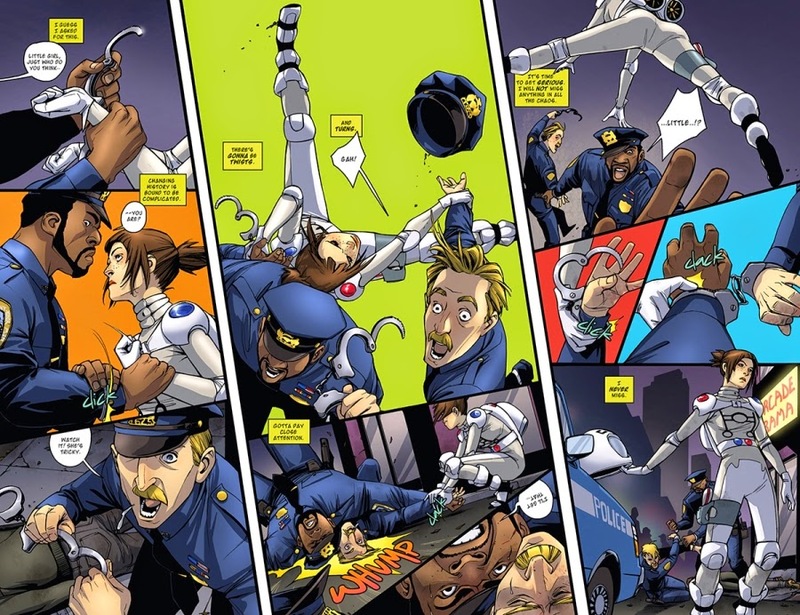 The character designs are distinctive and colorful matching the characters that Brandon has written. Rocket Girl or DaYoung Johansson's journey takes us back to the seedy 1980s of Times Square which plays as much an important role as the characters themselves. As a New Yorker growing up in the 1980s and above, seeing the background billboards and stores and the cops and vehicles of that era definitely draws on nostalgia of us somewhat old folks. While there is a lot to like about the series, my only gripe and it might be intentional is the vagueness of the antagonist(s) of the story and how they all tie together. You would expect a little more information through five issues, but there is still little to know about both Quantum Mechanics of the future which is apparently what Rocket Girl is trying to stop and just how the various pieces like Quantum Mechanics, the Teen Police and society in the future all came about and feeds off of one another. There is more than enough going for it that makes me want to continue reading and looking forward to more issues. With the fifth issue ending quite appropriately, heading out to a new adventure as DaYoung leaves behind her "future."